Why Study English at Providence College? Because you love to read and write. Because you want to challenge conventional thinking and celebrate landmark authors. Because you want to be prepared for professional life after PC. The English department at PC has something for everyone. Led by faculty who are teachers, scholars, and writers, our courses cover the full range of literature in English — from the medieval adventures of Chaucer’s pilgrims to the vibrant novels of Toni Morrison and beyond. Our classrooms are places where students and professors talk freely about the ideas, characters, and artistic choices they encounter. We offer three bachelor’s degree programs — English, Creative Writing, and Secondary Education. Each one is rigorous. Each one is engaging. Each one will enhance your ability to analyze, communicate, and research — important tools for anyone’s success. The English major allows students to read, study, and write about literature written in English, from the Middle Ages to the present. Dive deep into the writings of specific literary periods, explore the works of individual authors, and study one-on-one with professors through tutorials, independent studies, and senior theses. The creative writing major provides instruction from nationally recognized fiction writers and poets in small classes and one-on-one tutorials. 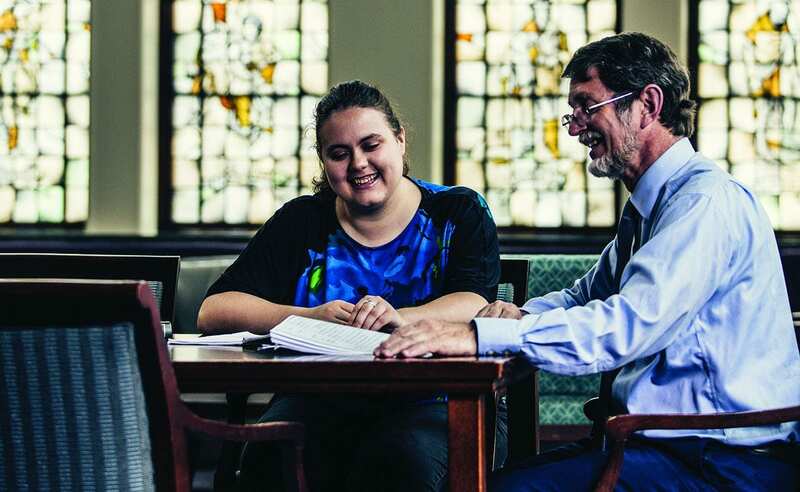 In addition to focusing on creative writing skills, students complement their writing courses with literature classes that cover a wide range of genres and literary epochs, from Chaucer to contemporary fiction and poetry. The English/secondary education major is designed for students who aspire to teach high school English. Our faculty bring their passion and experience to the classroom. They are authors of acclaimed books, award-winning poetry, and noteworthy journal articles. They present and lecture at national and international conferences and are recognized for their contributions to the field through prestigious awards and distinctions, including a Poetry Fellow and Alan Collins Scholar in Poetry at the Bread Loaf Writers’ Conference. They also hold the highest degrees from institutions such as Harvard, Notre Dame, and Yale, as well as the universities of North Carolina, Virginia, Michigan, Cambridge (UK), Helsinki, and Iowa. Sigma Tau Delta, the international English honor society.